The second of a set of Tankas created as part of the All Live is Sacred series, each with it's own inspirational quote and animal Buddha. 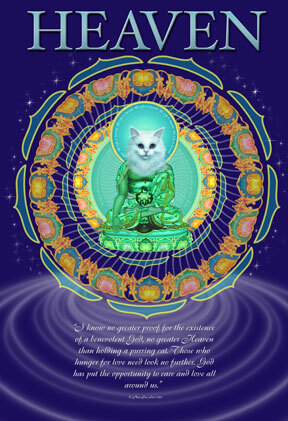 The quote on this art was inspired by the artists beloved rescued cats, Schaharazad, Precious, Muffin, Sweet Boy, Birdie, Willy Cat, Munchkins, Mump Mump and Trust Love. Available as print on fine art paper with archival inks 13 x 18 inches $50 and greeting cards and magnets.